Finally, disaster has come back to our cinemas. Directed by Brad Peyton (Cats & Dogs: The Revenge of Kitty Galore, Journey 2: The Mysterious Island) and written by Carlton Cuse (TV series Lost), San Andreas is an earthquake action-adventure that showed promise in its trailers with that haunting rendition of the song California Dreaming but turns out nothing more than a typical film of the genre with enough cliches for a fun prediction contest, if such a thing exists. It does have a more convincingly serious tone that a natural disaster picture should have, but it offers almost zero new ideas to the table and tends to be more adventurous than thrilling. The story is as familiar as it gets for the genre. Dwayne Johnson (Fast & Furious 7, Hercules) a.k.a. 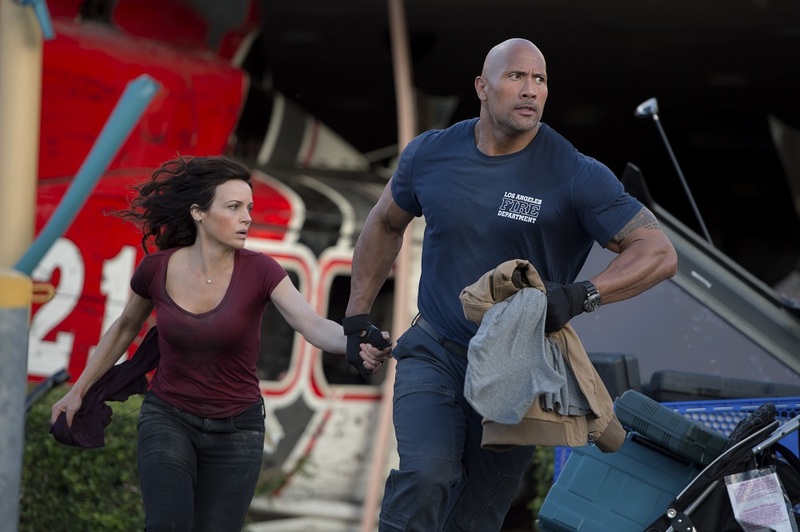 pro wrestler “The Rock” plays Chief Ray Gaines, an experienced Los Angeles Fire Department Search & Rescue helicopter pilot, who instinctively abandons his job and goes on a solo mission to save his soon-to-be ex-wife Emma (Carla Gugino) and college-age daughter Blake (Alexandra Daddario) from the series of massive earthquakes that’s hitting been San Francisco. The narrative of the film basically follows three groups of characters who’re in different locations — Ray and Emma, Blake with a pair of British brothers (Hugo Johnstone-Burt and Art Parkinson), and seismologist Lawrence Hayes (Paul Giamatti) with reporter Serena (Archie Panjabi). The third group is only in the film just to predict and explain how serious the situation is, which is quite redundant as they’re never in any real danger and have no connection with the other characters nor do they even meet in the film. There isn’t any fault in the performances of the main cast. The Rock goes beyond his usual macho charm to provide in the sentimental scenes. Carla Gurgino does well playing the realistically tough and yet scared wife who’s annoying and inconsiderate enough to talk about their worsening relationship while all these are happening, which lessens the urgency of their situation. Alexandra Daddario, who hid her assets well in the Percy Jackson films before letting them loose in the TV series True Detective, offers plenty of distraction with her gorgeousness that would likely delight male audiences when she takes off a layer of her top before the tsunami strikes. By the way, her performance is decent as well, playing the competent young girl who uses all the firemen knowledge her father gave her. Dr. Lucy Jones, a real-life seismologist, has tweeted enough for the world to know that the things depicted here is not very accurate and may even be a bad advice. However, that wouldn’t have mattered that much if the film was thoroughly entertaining and thrilling, like other scientifically flawed disaster films such as Gravity (2013), Twister (1996) or even Armageddon (1998). The depiction of the disaster is visually stunning with spectacular special effects of moving and falling buildings, cracking grounds and tsunami, but the action scenes probably won’t keep anyone at the edge of their seats, especially when it’s mostly predictable. There are two moments that would make at least a few people question, “Why the hell didn’t he just do that in the first place?” The Rock’s full of muscles, but his character doesn’t use his strength until there’s no other option left, just so that it wouldn’t seem too easy for the protagonist. Ironically, it’s also sad that none of the main character dies, which totally defeats the dramatic purpose of all that story and character development. 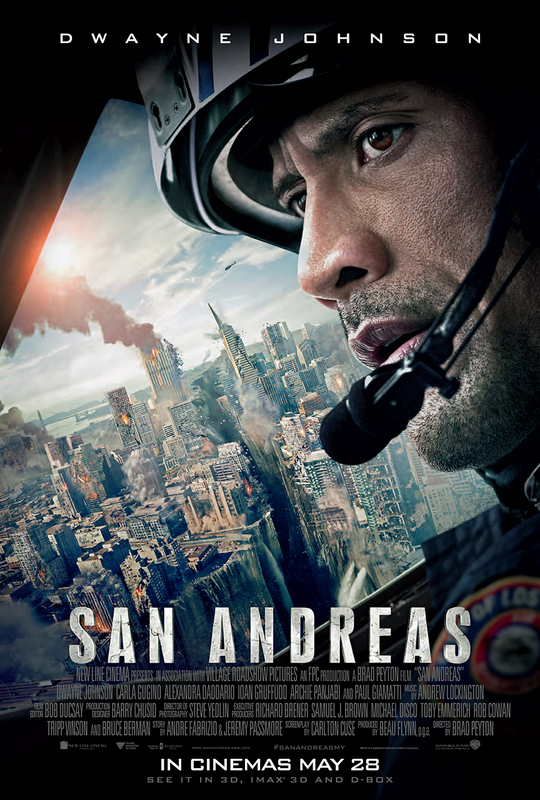 However, the film does seem justify three actions that might save lives if such disaster happens — drop, cover and hold on to something; use a landline when cellphones don’t work; and if you’re high up in a building, get to the rooftop even though it’s going to be collapse. The highly predictable Hollywood ending is complete with, of course, an American flag and a positive note with the main characters enjoying the view of the sunset together, safe and sound. That happens almost as soon as the characters found each other. So it feels as though Ray could’ve just told Emma to meet him at the safe zone instead of putting each other through all that danger and trouble. Malaysia censorship: Vulgarities are muted. That’s all, I think. To watch in 3D? It’s like watching in 2D. There’s a bit of depth but not impactful at all. Second opinion: My girlfriend thought that it was quite fun to watch despite the cliches. 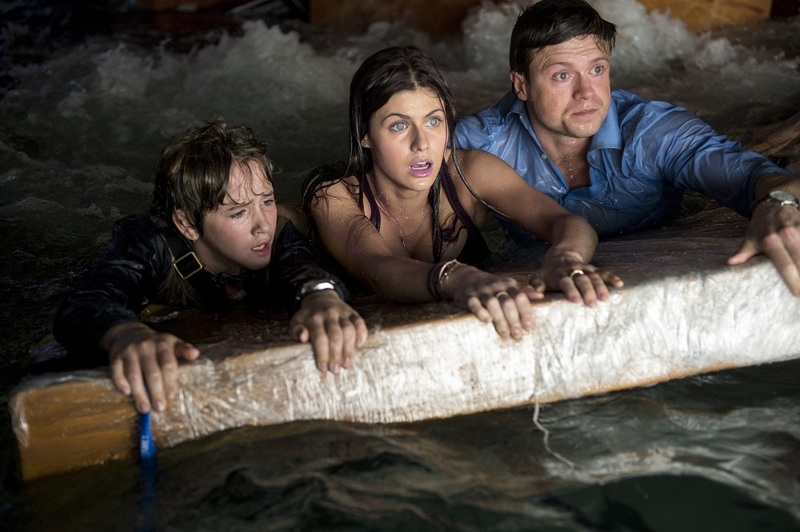 Verdict: Typical disaster film with slightly lesser stupid moments than most of the others in the genre.